Located at the base of the Sierra foothills, Folsom Lake and recreation area offers opportunities for hiking, biking, running, camping, picnicking, horseback riding, water-skiing and boating. Good fishing for both cold- and warm-water species includes rainbow trout, brown trout, black bass, catfish, crappie, and bluegill. Visitors can also see the Folsom Powerhouse (once called "the greatest operative electrical plant on the American continent"), which from 1885 to 1952 produced 11,000 volts of electricity for Sacramento residents. For cyclists, there is a 32-mile long bicycle path that connects Folsom Lake with many Sacramento County parks before reaching Old Sacramento. The park also includes Lake Natoma, downstream from Folsom Lake, which is popular for crew races, sailing, kayaking and other aquatic sports. 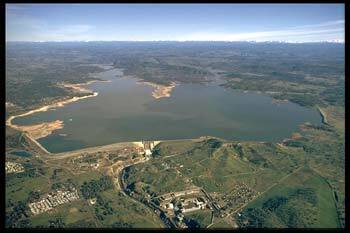 Folsom Lake was created by Folsom Dam across the American River. The lake features some 10,000 surface acres of water when full and has 75 miles of shoreline. It extends about 15 miles up the north fork, and about 10 1/2 miles up the south fork of the American River. The Lake level normally varies from 466 feet elevation in early summer to a low of 426 feet in early winter. Recreation at Folsom Reservoir is managed by the California Department of Parks and Recreation under agreement with the Bureau of Reclamation, Central California Area Office. Facilities include 3 public campgrounds, 2 with showers, 60 miles of equestrian trails, 10 miles of paved bicycle trails, 8 miles of advanced mountain bike trails, and excellent year-round bank or boat fishing. Several launch ramps provide continuous boat launching access throughout the lake fluctuation zone. The American River Water Education Center at Folsom Dam contains exhibits that promote water education directly related to the American River Watershed. Usually open 7 days a week, 7:00 a.m. to 10:00 p.m., contact the park office for seasonal variations.